In need of some ideas for your next decoupage project? Try some of these creative crafts! From furniture to fashion accessories and everything in between, you'll discover something inspiring to claim for your next project. The next time you're at your local home improvement store, pick up some cheap ceramic tiles. 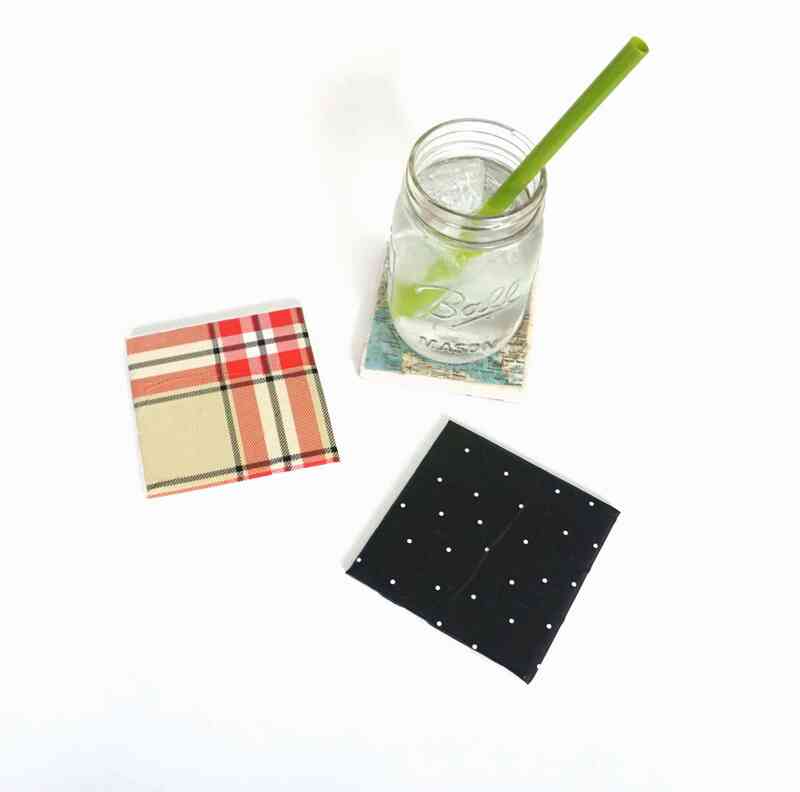 They make the perfect base for DIY coasters! Using decoupage, you can personalize each tile to create a stylish and still functional project. Give an old thrift store plate new life with decoupage. No one will ever guess the humble origins of your "new" home decor object. Keep your necklaces all in the same place with this adorable and practical handmade jewelry rack. This thrifty storage idea costs about ten dollars to make, which is much cheaper and cuter than anything store bought. Decorate your eggs this Easter without dye. Make these beautiful eggs with leaves cut from paper napkins and then decoupage them onto an egg. The Berså style pattern used is quite popular in Sweden, but we think everyone will love the simplicity of this design. It is possible to add a pretty decoupaged background to a plastic or glass plate used to serve food. There are now dishwasher safe decoupage mediums that you can use for your projects. This unique product opens up a new world of crafting! You should still hand wash all decoupaged dishes just to be on the safe side. Can you believe this beautiful tray started out as a baking pan? A little bit of gold spray paint and some vintage style butterfly prints transformed an ordinary baking pan into a gorgeous serving tray. Never lose any of your rings again! Cover an ordinary handmade paper cone with pretty fabric or decorative paper and slip your rings over the top to keep them safe and organized. Plain white sneakers are transformed into a work of art with fabric and Mod Podge. Your feet will want to do a happy dance when wearing these adorable shoes. Bold floral photograph wall decor is on trend right now! 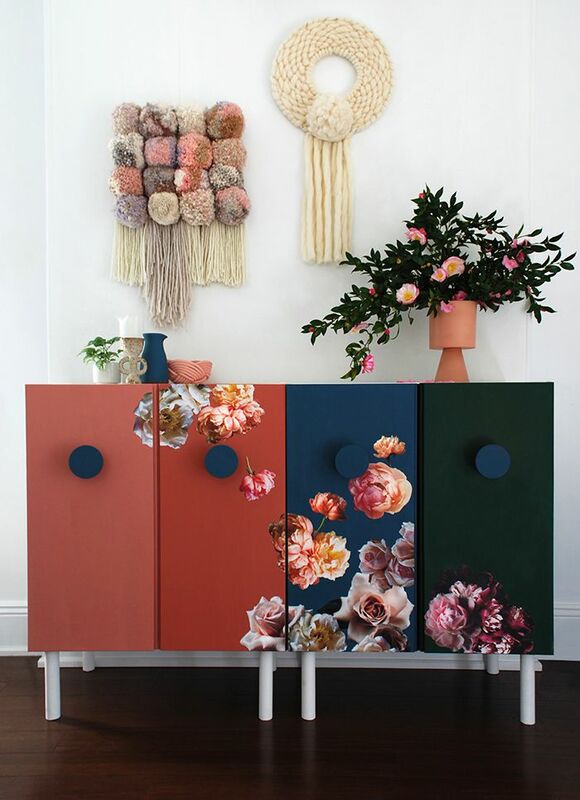 Lisa Tilse shows how to combine flower photographs and Annie Sloan chalk paint on an inexpensive piece of IKEA furniture. The results are stunning. This sideboard is not your ordinary piece of decoupaged furniture, but truly a statement piece you will be proud to display in your home. Coasters are one of those things that you can never have enough of. Make some from tiles found in every home improvement store. All you have to do is glue a square of pretty paper or fabric onto the tile and coat with waterproof decoupage medium. Quick and easy! Add some sunshine to your life with a colorful decoupaged flower pot. Apply tissue stips to any container with Mod Podge. The result is a cute, inexpensive container for the flower of your choice. You could also use the containers to store pencils, pens, and office supplies. If your shelves have seen better days, you can give them new life with a layer of decoupaged fabric. It adds a pop of color to your room that will lift your spirits and make you smile. The first Eames chairs from the fifties were made from molded fiberglass and were extremely popular. Plastic knockoffs are still around today proving that good design is timeless. Give your Eames knockoff some extra style by decoupaging flowers onto the seat. Transform ordinary wooden hangers with patterned tissue paper into something special. Your closet will never have looked better when you adorn it with these wooden beauties. Why not color code your hangers for organizational purposes? You could use one color for shirts, one color for pants, etc. Keep your jewelry within easy reach by gluing cork board onto the back of a cupboard door and covering it with bright decoupaged fabric. If you like natural elements in your home decor, you will love this project. Bring nature into your home by decoupaging green leaves onto a pendant shade, giving your home instant style. Ordinary terracotta pots are decorated with paper napkins to give them a bit of color and welcome spring.This napkin technique is a quick and easy way to add a burst of color to your greenery. Glass bottles can be decorated with cutouts. The trick is to apply the art to the inside of the glass jars and bottles, giving the outside of the container a smooth surface. Are you looking for a unique and creative way to keep your keys together? Cover a Jenga game block with decoupaged paper squares and turn it into a cute keychain. Cover some real or wooden eggs with decoupaged scrapbook paper to celebrate Easter or Spring. They make a lovely centerpiece when grouped on a layer of moss in a beautiful dish. Recycle those old wine bottles into unique pieces of home decor. Discover how easy it is to decorate an ordinary wine bottle using clipart and decoupage medium. Watch Borax Crystals Grow for Snowflakes or Science Projects!